Enseigne Depicting St. George on Horseback Slaying the Dragon. Worked in Repoussé, Chasing and Enamel on Gold and Accented by Rubies, Diamonds and Emeralds. An enseigne was a sixteenth century badge displayed on a hat. Badges that were symbolic and decorated by the wearer’s portrait, monogram, patron saint or other mythological or Biblical imagery were referred to as enseigne. 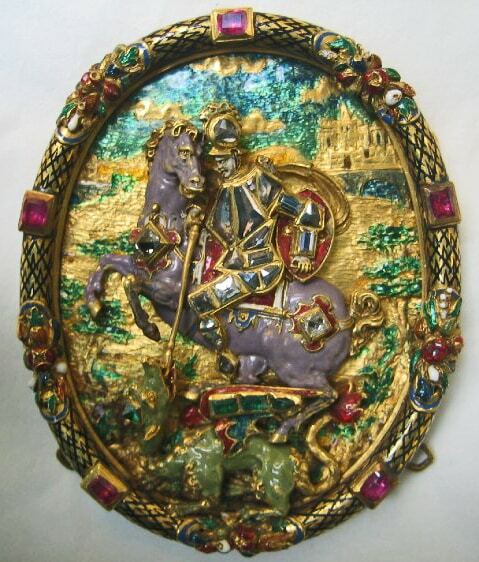 Often they were elaborately enhanced with enamels, gemstones and cameos and set within floral filigree frames. Usually loops along the edge or holes pierced through the medallion were used for sewing the badge onto a cap. Women though, often wore these elaborate enseigne as pendants. Charles VIII of France wore this type of ornament wrought in gold on his cap while his men wore similar badges in lesser metals. The fashion spread throughout the European courts and from there to noblemen and those who emulated them. The enseigne remained in vogue until the late sixteenth century when aigrettes replaced them in popularity. Norris, Herbert. Tudor Costume and Fashion: Mineola, NY, Dover Publications, 1997.